Supporters of the South Devon Railway are toasting success today (5/12/07) after being named as Ian Allan Publishing’s ‘Heritage Railway of the Year’, making it the top steam-operated line in the country. The much sought after ‘Heritage Railway of the Year’ award is given by Ian Allan Publishing to just one heritage railway each year in recognition of their high levels of customer service and the individual rail line’s contribution towards recreating the historic railway ambience of yesteryear. Announced during the National Railway Heritage Awards (NRHA) ceremony in London today, competition between the heritage railways in the country for this prestigious award is fierce but friendly, making the South Devon Railway’s achievement in winning the title all the more commendable. 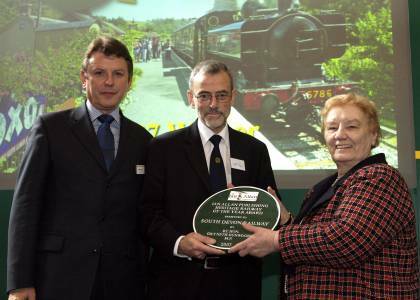 It’s the second year running that the South Devon Railway (SDR) has scooped a National Heritage Railway Award accolade. In 2006, it won the GNER Volunteers Award for the restoration of the line’s Littlehempston station at Totnes. SDR Trust Chairman Alan Taylor and fellow director Denver Woodward, plus SDR Association Secretary John Keohane, were in London to receive their railway ‘Oscar’ from the Rt. Hon. Gwyneth Dunwoody MP and David Allan (sponsor) at a special ceremony in the Merchant Taylors’ Hall today. The South Devon Railway team received a special commemorative plaque from the judges, which will be displayed at Buckfastleigh station on their return. “We are both proud and thrilled to win this top award for the first time since we took over the line in 1991 -- it’s been a great team effort to achieve this accolade. “In making their award, Ian Allan Publishing’s judges pay incognito visits to nearly 200 preserved railways around the country where they travel as ordinary members of the public and take note of how the lines are run and what’s on offer for visitors. “They judge railways on the quality of service, the presentation and helpfulness of staff, the stations and coaches, the catering and toilet facilities, and the day out as a whole experience. “To win a major railway heritage award for the second year running speaks volumes for the hard work put in by every member of our great team. Our railway prides itself on its friendly atmosphere and strong teamwork between staff and volunteers. “Winning the Ian Allan Publishing Heritage Railway of the Year award is a very big feather in the South Devon Railway’s cap. “It’s just reward for all of the hard effort and dedication that our volunteers and staff put into running the railway. “The South Devon Railway is going from strength to strength every year now, and we have recreated a living country branch line that exudes much of the charm and character once seen on the old Great Western Railway system.